As I type this I am watching a pressure canner gauge. It is my job to make sure that the pressure gauge does not fall below 10. Our canner is great if we need a pressure of 15, it regulates that for us, but the lower pressures we have regulate ourselves. Personally, I hate this job. I am a water bath canner girl, but my husband loves the pressure canner and I can’t can chicken stock without it. It is safe to say we have a love, hate relationship. This week we have canned salsa, both hot and mild, as well as chicken stock. I don’t know why but we always seem to start canning at 10 PM at night. Anyway, our garden has been doing great. 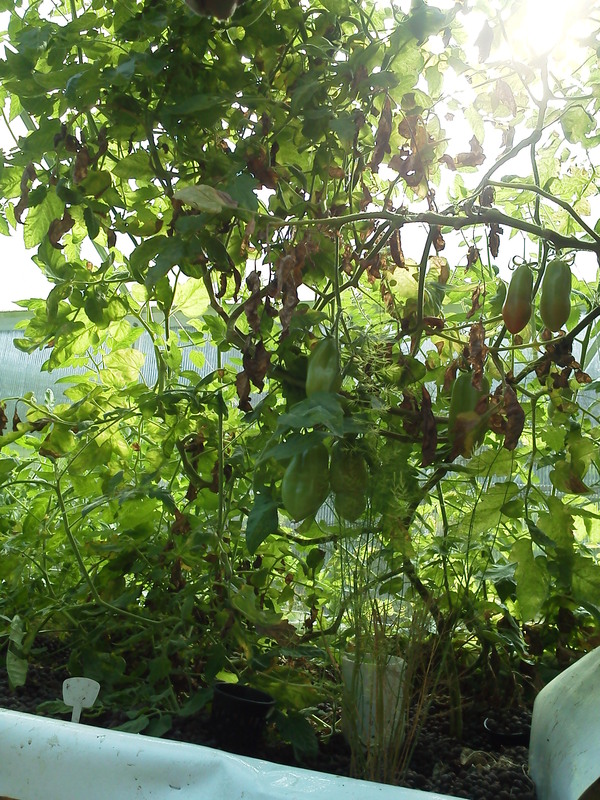 I love making salsa with the tomatoes that I have grown and the peppers and the onions and the herbs.. it is just be best feeling. 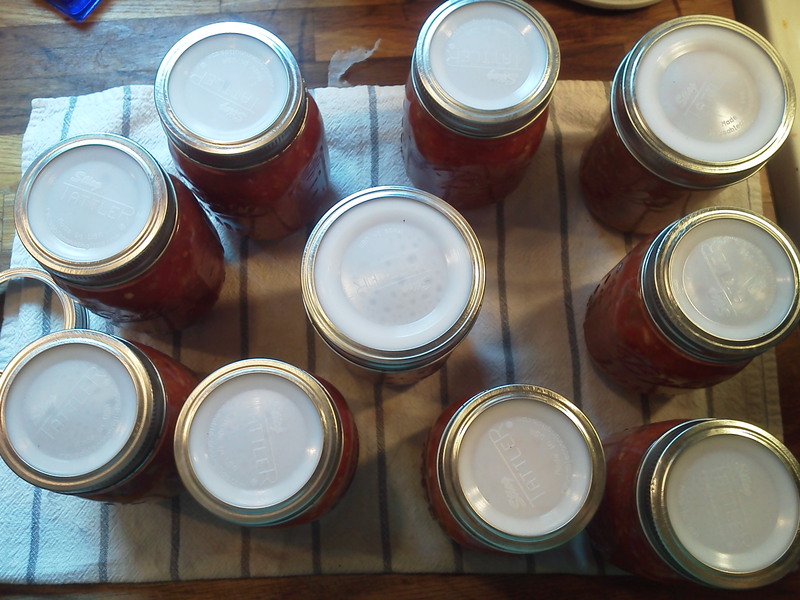 I have learned how to make smaller batches and I am ok with canning more often to be able to can our own produce. There is just something magical to me about being able to can food that you have grown or raised. This week has been a very busy week for us all over the homestead. We have 100 new tilapia, which is very exciting. We have a nursery in the house and the males and females are separated in the green house. The last batch of tilapia had to be mail ordered, we are very thankful that this batch was from a local hatchery. It was great to stoop sit in Baltimore City, hon, and talk fish. That is just not something I get to do everyday. 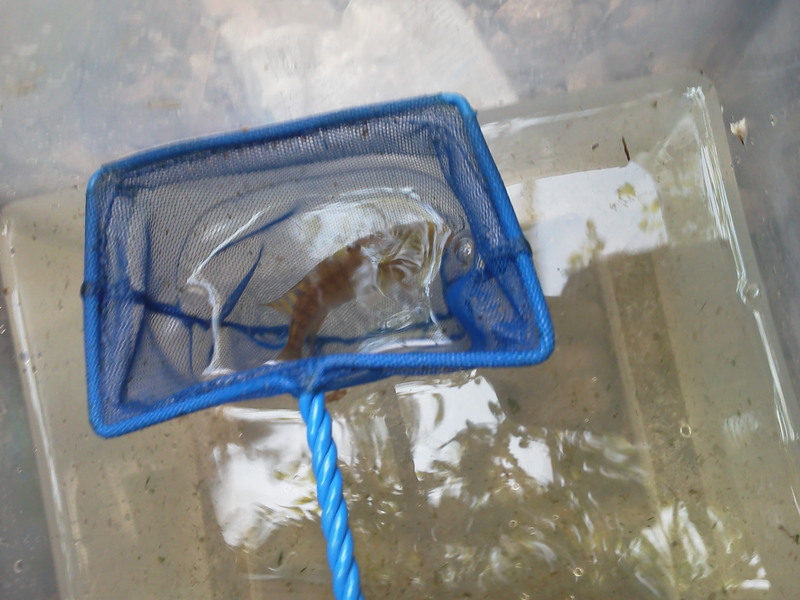 The fish look wonderful and are doing great and we made a new contact in the fish world. All and all I call that a win! This was a rough rabbit week though, one of our 9 month old bucks was out in the run and broke his back. We are not sure if he was spooked and jumped into the side of the run or if he got his toe caught in the bottom wire, either way he was a broke boy. My husband did what needed to be done and he is in the freezer. We are going to try and tan the hide in order to give him as much respect as possible. We don’t want any of his life to go to waste. OK on a up side we are transitioning into fall and winter planting. 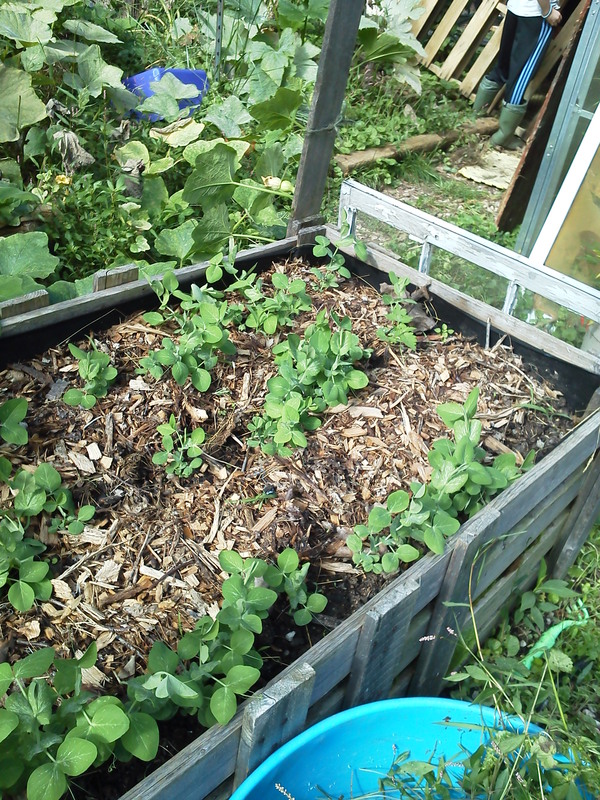 As beds become empty we are adding new compost and replanting them with fall and winter crops. 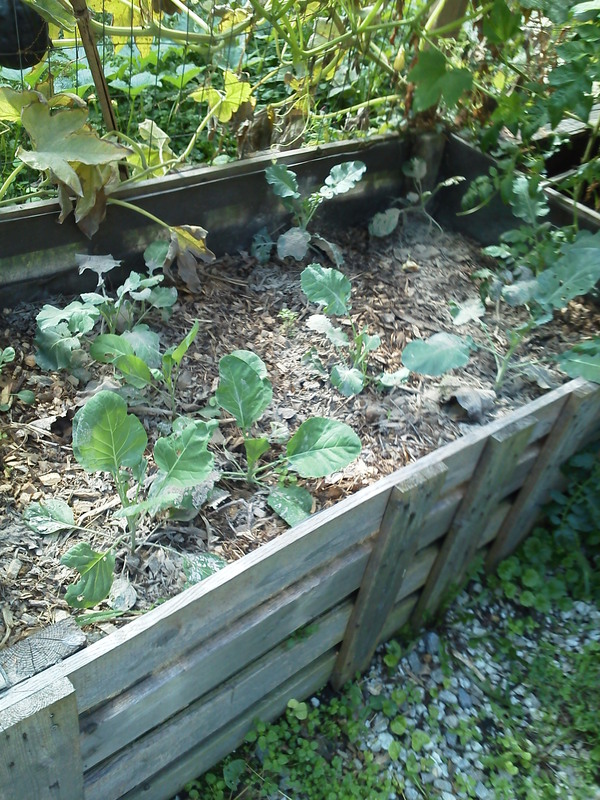 So far we have planted a new set of snow peas, carrots, beats, turnips, radishes, lettuce, parsnips, cabbage, and broccoli. Tomorrow I will be starting some “greens” to go into the float raft in the aquaponics system. The aquaponics system is doing great. 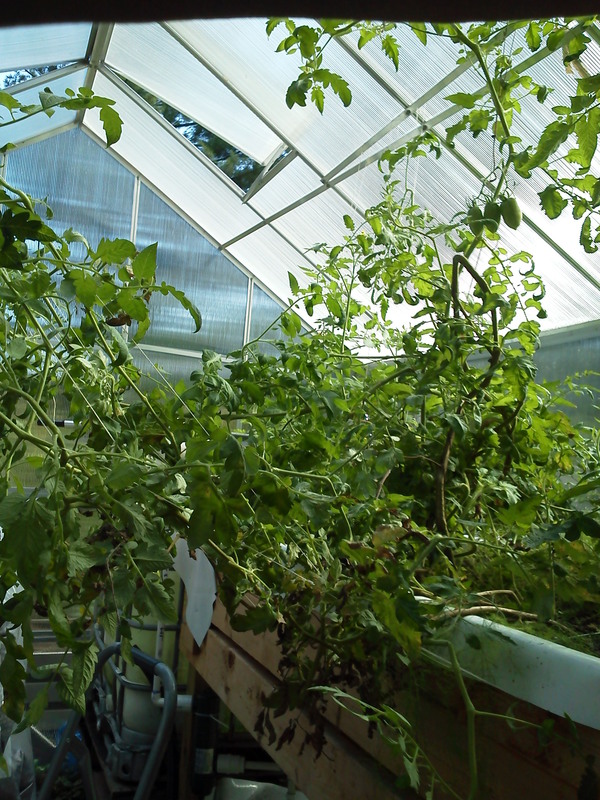 We have tomatoes growing out the top vents and we had to tie them up to the point that we can’t even stand up in the greenhouse, the tomato plants go from one wall to the other. 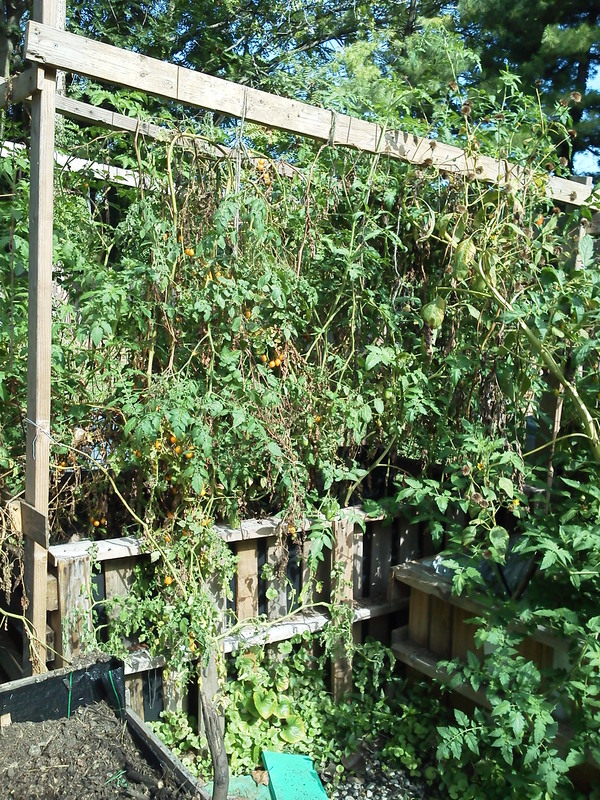 It really is just amazing to see so much growth in tomato plants in September. It hope that we are able to continue the growth through the winter. Our goal is by next spring we will have two aquaponics systems going in the green house so that we can have twice the blessings.